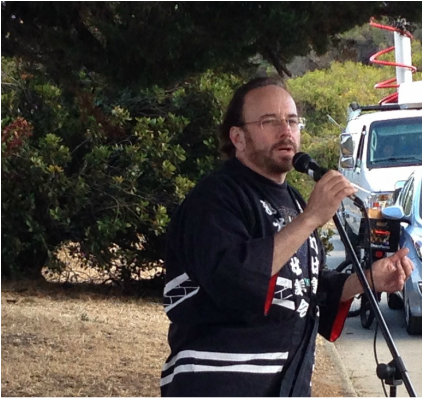 In March 2002, the then-Vice Chair of the City of Berkeley Peace and Justice Commission, Steve Freedkin, was invited to Japan to speak at a peace conference. On the first day of his visit, he toured the Osaka Peace Museum, where he met Ms. Takako Iga, a survivor of the firebombing of Osaka during World War II. Ms. Iga explained to him that Osaka and most other Japanese cities were destroyed by incendiary bombs during the war. Steve asked Ms. Iga whether she attends a peace lantern ceremony every August. She said she used to, but her health does not always allow her nowadays. ​Deeply moved by her story, Steve promised he would attend such a ceremony each year on her behalf. With support from the Berkeley Peace and Justice Commission, the City Council and numerous community organizations and individuals, the first annual Bay Area Peace Lantern Ceremony was held at Aquatic Park on Aug. 9, 2002. More than 100 people participated that year; by 2006, the annual event had grown to more than 650, and in 2015, more than 2,000 people took part in the ceremony.